Not sure exactly when my obsession began, but somewhere on the way I decided I was going to knit a lopapeysa before traveling to Iceland this spring. Thankfully, I have since retired the idea. Or rather, changed it slightly. Instead of knitting it for Iceland, I’m going to knit this lopapeysa with yarn acquired in Iceland. It will be more special that way! That decision was, of course, followed by hours and hours of staring at pretty yokes on Ravelry. After all, I’d like to travel to Iceland with a plan, so I can buy yarn accordingly. There are so many beautiful yoke sweaters out there, both traditional and modern. Add to the mix all the different color possibilities, and options are endless! I have managed to narrow down my favorites to these six! I was hoping perhaps you could help me pick! Which one's your favorite? Or perhaps you have another that you're in love with? 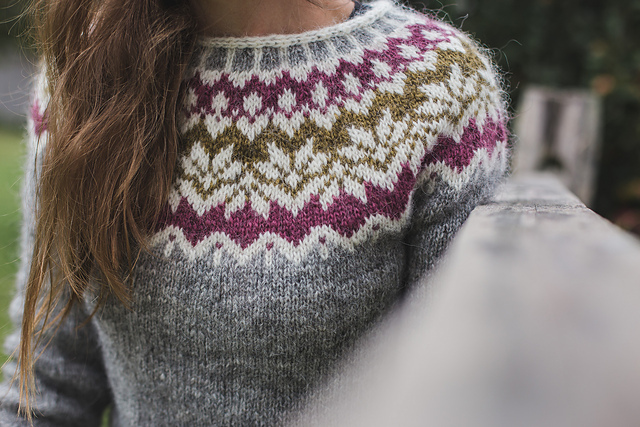 Plus, all the colorwork sweaters (and everything else too) designed by Marie Wallin! You see why I'm having a hard time deciding?